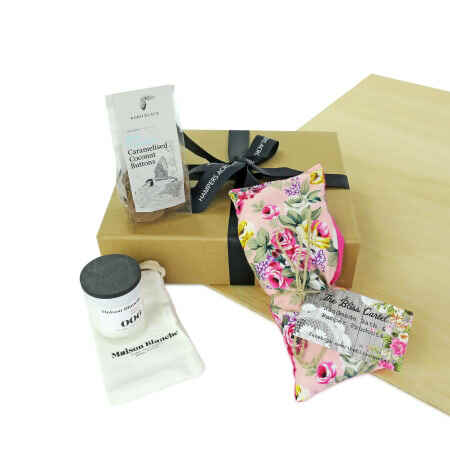 This important occasion calls for a thoughtful, pampering gift like our You're So Special hamper! Your beloved recipient will enjoy lighting Maison Blanche's 15-hour rose & amber soy wax candle and letting the beautiful scent of fresh garden roses, lily of the valley and bold amber mingle in the air, then she can either cool or heat The Bliss Cartel's lavender eye pillow for a seriously relaxing nap or mediation session. And what kind of pressie would it be without some heavenly chocolates? Koko Black serves up button-shaped delights featuring milk chocolate and yummy caramelised coconut. Crunchy caramelised coconut blended with premium 34 % milk chocolate. Handmade locally in Melbourne by Koko Black. Relax with Bliss Cartels beautiful lavender eye pillow. Perfect for meditation, relaxation, to ease stress and tension or just for an indulgent break. first time user. was very happy.